On Friday, August 29th at noon, the Crossroads group will have a homegroup member celebrating 1 year clean with a speaker meeting. On Friday, August 15th at noon, the Crossroads group will have a homegroup member celebrating 2 years with a discussion meeting. WE OPENED THE COMMITTEE BY VOTING JOSH M AS OUR NEW SECRETARY OF ACTIVITIES, WE WERE TOLD OUR PEOPLE WERE INTERESTED, BUT NO ONE SHOW UP TO EXPRESS INTEREST IN THE POSITION. WE DISCUSSED THE CAMP OUT FROM LAST MONTH, I WENT OVER THE RECEIPTS WITH THE SUBCOMMITTEE, EVERYTHING WAS IN ORDER, I HAD MISS PLACED ONE OF THE RECEIPTS FROM DOLLAR GENERAL. WE SPENT ALL 500.00 DOLLARS THAT AREA HAD GIVEN US, PLUS MORE. AFTER WE GOT THERE AND SEEN THAT THERE WAS MORE PEOPLE THERE THAN EXPECTED WE HAD TO RENT 2 MORE SITES FOR THE 2 DAYS AND 1 MORE SITE FOR 1 NIGHT. OTHER THAN A LITTLE BIT OF RAIN THE CAMP OUT WAS A SUCCESSFUL EVENT THAT HELPED THE UNITY OF NA IN THE GTO AREA. WE ALSO DISCUSSED THE HALLOWEEN PARTY THAT WILL HAPPENING IN OCTOBER WE HAVE NOTE SET A FINAL DATE ON THAT AND WE ARE ALSO LOOKING FOR ALTERNATE SITES FOR THE HALLOWEEN PARTY. MORE INFO TO FOLLOW. WE ALSO DISCUSSED A MOTION TO PUT IN FRONT OF AREA TO INCREASE OUR STANDING BUDGET OF $400.00 TO BE RAISED TO $500.00, DUE TO THE FACT THAT THE COST OF FOOD, RENT FOR FACILITIES HAVE INCREASED OVER THE LAST YEAR, WE VOTED AND IT WAS VOTED UNANIMOUS . GRATEFUL TO SERVE, TONY T.
Attendance: Jason L. Elijah C. Ryan D. Ryan B. Josh M. James J. Tanner W.
Wayne M. Tasha W. Stephen S. Kristen S. Megan C. Rachel N.
Twelve Traditions read: James J. Any insight would be appreciated. Grateful to serve, Jason L.
Greetings from the library liaison,due to recent events Sean H will continue filling this position until Kristen S. reaches 90 days. Until then she will be shadowing Sean to gain experience with the position. They are planning to go and check on their contacts on Saturday the 26th. Greetings from communications, all Cabell county contacts were called and we are in good standing with them. We scheduled a day to provide these contacts with schedules, and have added a few contacts to the list. We plan to come to an agreement on a day for our Wayne county contacts and those places will be called when we have decided on a date. New contacts are Her place, and St. Marys. grateful to serve Rachel N.
Attendance: Dee Dee G., Nick C., Amber B., Elijah C., Jaymie B., Sue C., Tanner W., Nate H., Chris W., Megan C., April P., Sean H., Dave, Jason P., Brittany O., Bo V., Rachel N., and James J.
Concepts read by Brittany O. Traditions read by James J. All is going well. Brian C. And Joe M. Filled in for me while I was on vacation. Anyone with willingness to go in contact Paul M. Or Bo V. Grateful to serve, Paul M.
Hello hello! Adolescents panel is doing very well, so much willingness everyone shares reads n participates so beautiful. Also I've reached out and began taking in new cycles of people :)) everything is great. Thank you and very grateful to serve Brittany O. Meetings going great there's approximately 4-6 addicts attending and they seem to be very grateful we are there. I have been attempting to rotate addicts to go in with me and have been successful so far. I'm going to attempt to get the H&I more on a presentation level instead of a meeting. The only needs I have for from the subcommittee is a updated workshop list and a format if all possible. I want to apologize to the committee for not attending this subcommittee due to being out of town and express my gratitude for allowing me to serve. Greetings bi-weekly Thursday night panel at Pinecrest is going well. I had plenty of requests and willingness by members to go in. Everything has gone smoothly and I have no issues needing addressed. I was asked by a member to curb profanity in my panels and I look forward to cleaning that up and the opportunity for growth therein. Grateful to serve Elijah C.
Jason P. Made motion to change Subcommittee time from 7pm to 6pm to allow members to attend other meetings and to allow home group which meets in that room to set up. The last H&I policy has not been updates since 2012. Discussed taking motion to area in order for it to be changed. Jason also made motion to change policy from panel members to all elected positions and members be removed if they miss two subcommittees. Jaymie B discussed the request for St. Mary's to have H&I meeting due to the changes in ownership they are presently undergoing. Subcommittee discussed previous request from Golden Girls for H&I and also interest from a member to possibly discuss meeting for Bateman. All new meeting issues were tabled until present meetings are stable. Discussed Rachel N to go in one more time with Jenny H to Presley Ridge and H&I chair to follow up and assure that residents will attend due to the last two times of residents not showing up. All panel members request schedules at next Subcommittee. Subcommittee discussed panel members snatching letters from residents during H&I meeting. Subcommittee discussed if meeting gets out of hand to end meeting and find staff to address problems. All reports are to be to Carrie G. at goodcarrie@ymail.com. New panel participation lists with names and phone numbers of members who have taken H&I workshop were handed out. Discussed possible H&I workshop at upcoming September picnic. Closed meeting with a group hug and prayer. Greetings from Another Chance to live. Our doors are open on time, coffee made, literature out and the message is being delivered. We have a $42 donation to area. “Hope Without Dope” Group - 7/20/14 - All is well at the Hope Without Dope group of Narcotics Anonymous. The doors are open on time, literature is on the table, coffee is hot, and the life-saving message of Narcotics Anonymous is being carried. We have 30-40 in attendance every Sunday. We have no donation to area this month. - Grateful to serve, Jason L.
Greetings from the God's Will Candlelight Group of Narcotics Anonymous. We have a varying attendance to our homegroup. One week we have 60 people, the next maybe 20. The meeting is set up, coffee made, literature out, and doors open promptly on time so the life saving message of NA can be shared. We would like to thank both last month's speaker, Jackie from NANA, and this month's speaker, Jason L from our very own GTO. God's Will Candlelight Group would also like to welcome our newest homegroup members, Dave W and Christopher. Unfortunately we have no donation to make to Area at this time. Grateful to serve, Jaymie B.
Saturday Night Trust the Process - Group Report 07/20/14 - Meetings are going well and are opened on time each week. Literature is stocked, rent is paid, & the message of NA is being shared. We average 70 people per week. No donation is available this month. 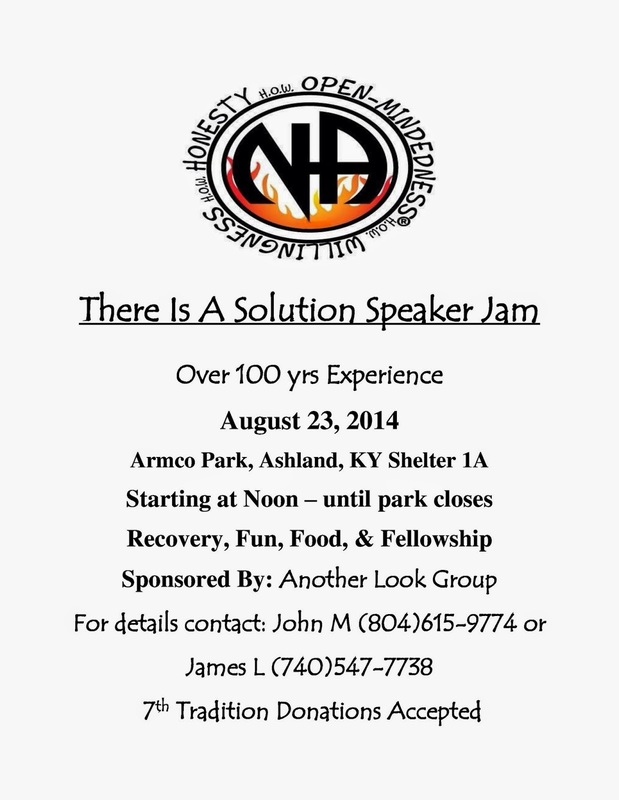 - ILS - Terri M.
All is well with the Hope Through Surrender group of Narcotics Anonymous. The doors are open on time, we average about 15 people per week, coffee is in the pot, literature is on the table and most importantly the message of recovery is being shared. We have a $20 donation to area at this time. - Grateful to serve, Tasha W.
Hello hello from the not high noon group! All is well with our meeting, attendance is like always averaging 10-15 a week. Doors are open and the narcotics annonymous message is freely shared. We have a picnic speaker function august 5 starting at 1130 am and speaker Rachel n at noon. - Grateful to serve brittany O. The Monday Night Together We Can group is going well. Doors are open on time, rent is paid, literature is on the table, and the lifesaving message of NA is being shared. We have a homegroup member celebrating 1 year on July 21st! We have no donation for area at this time. - Grateful to serve, Paul M.
Greetings from women in NA! The meeting is going very well. We have an attendance of 5-8 addicts per week.. Doors are on time, Literature is on the table, coffee in the pot and the message of NA is being carried. We have no donation for area at this time. Our meeting could use more support so please spread the word. - Grateful to serve Alana M.
Doors are open at 11am weekly, literature is on the table, coffee in the pot, circle set up. There are 8-15 in attendance, good narcotics anonymous message is being shared. We would also like to request that the meeting be placed on the area schedule- Robbie C.
Greetings from the crossroads group of NA, The doors are open on time. coffee is in the pot, and the life saving message of NA is being heard. At this time, we don not have a donation for area. We have 10-25 average attendance. we have an addict celebrating 2 years on August 8th.- Thanks Josh M.
Greetings from the clean possibilities group of narcotics anonymous all is well. The doors are opening on time, coffee in the pot, and literature is on the table. The life saving message of NA is being carried. We have no donations to area this month.- Grateful to serve Ryan B.
Greetings from Choose to live group on Narcotics Anonymous, We are now separate from the Monday another chance to live group. Meetings are going well and have been opening and closing on time. We will be placing an order for literature to replenish our stock. Coffee is hot and most importantly the message of NA is being carried. We have an attendance of about 50 addicts. We also have a ten dollar donation for area at this time.- Grateful to serve Jimmy E.
Hello family, Greetings from the Progress Not Perfection group of Narcotics Anonymous. Our doors are opening on time, coffes being made, literature is on the tables and the message is being carried. We have 65 to 75 addicts in attendance each week and we have a $40 donation to area at this time. Grateful to serve Megan C.
Date: July 20, 2014 By: Hospital and Institutions Subcommitte Deeidra G.
Motion: To change time in H and I policy for subcommittee monthly meeting from 7:00 pm to 6:00 pm to allow attending members to attend other NA meetings. James L. - Another Look Homegroup, Cattlesburg, KY requested support for meeting. Kristin S. - No Pain No Gain Homegroup is in need of keytags and support for the meeting. Two members of the Small Town Big Recovery Homegroup in Ironton, OH. attended Area and are requesting to be added to GTO area schedule. Activities Subcommittee requested homegroup donate side dishes for upcoming picnic on September 13th.